Multiple drug resistance is a condition enabling a disease-causing organism to resist distinct drugs or chemicals of a wide variety of structure and function targeted at eradicating the organism. Infections caused by multidrug-resistant (MDR) bacteria are an increasing problem world-wide. The interaction among several genetic host factors, distinctive anatomical and other features of the bacteria, and hygiene measures, play a paramount role in the treatment of infections caused by multidrug-resistant organisms. 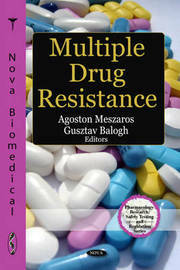 This important book gathers the latest research from around the world on multiple drug resistance and its clinical consequences.